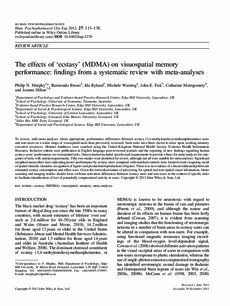 To review, with meta-analyses where appropriate, performance differences between ecstasy (3,4-methylenedioxymethamphetamine) users and non-users on a wider range of visuospatial tasks than previously reviewed. Such tasks have been shown to draw upon working memory executive resources. Abstract databases were searched using the United Kingdom National Health Service Evidence Health Information Resource. Inclusion criteria were publication in English language peer-reviewed journals and the reporting of new findings regarding human ecstasy-users’ performance on visuospatial tasks. Data extracted included specific task requirements to provide a basis for meta-analyses for categories of tasks with similar requirements. Fifty-two studies were identified for review, although not all were suitable for meta-analysis. Significant weighted mean effect sizes indicating poorer performance by ecstasy users compared with matched controls were found for tasks requiring recall of spatial stimulus elements, recognition of figures and production/reproduction of figures. There was no evidence of a linear relationship between estimated ecstasy consumption and effect sizes. Given the networked nature of processing for spatial and non-spatial visual information, future scanning and imaging studies should focus on brain activation differences between ecstasy users and non-users in the context of specific tasks to facilitate identification of loci of potentially compromised activity in users.